We stock a large range of men's titanium bracelets with our men's titanium bike link bracelet being one of the best selling products across the website. Most of our men's titanium bracelets are available in sizes 21cm to 23cm from stock. All of our men's titanium bracelets and bangles are made from lightweight, hypoallergenic titanium, and each piece will carry our own unique Titanium logo as featured on our gift boxes. UK sizes 20cm - 8 " or 23cm - 9"
UK sizes 21cm - 8.25" / 23cm - 9"
UK sizes 21cm - 8.25"
UK sizes 23cm - 9"
All of our titanium bracelets and bangles are made from lightweight titanium, 4 times stronger than steel, but with half the weight so you will be surprised how light the bracelet or bangle will be. All of our titanium jewellery is made from commercially pure titanium, which is typically 98% to 99% pure. Titanium is completely hypoallergenic, so is a great material for those with metal allergies. 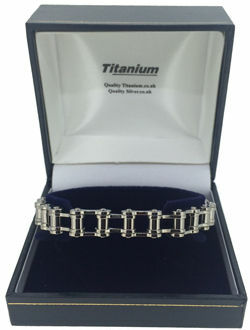 The most popular of our designs are the titanium bike bracelets available in either plain, or with black internal links, and in a choice of 2 sizes. These bracelets out sell all of our other designs combined. All of our titanium bangles and bracelets are held in stock for a fast dispatch. All of our titanium bracelets, and titanium bangles will arrive in either a deep square titanium branded box, or long flat titanium branded box depending on the product. Each item of titanium jewellery will also be discreetly laser engraved with our own unique logo matching the logo of the box. Our Titanium Bracelets have been rated 9.8 out of 10 based upon more than 36 customer reviews.